Vinyl Acetate Monomer (VAM) Market size was valued over USD 7 billion in 2016, and the industry will grow at a CAGR of 4.6% by 2024. Vinyl acetate is a clear colorless liquid which is slightly soluble in water, act as an intermediate for making innumerable polymers and resins for coatings, textiles, adhesives, paints, etc. It polymerizes when heated or contaminated. This intermediary compound is predominantly used to manufacture polyvinyl acetate which has better bonding properties with various substrates like paper, plastic films, metals and wood. Further other application of polyvinyl acetate includes paper coatings and industrial coatings. Polyvinyl alcohol is the most comprehensive consumer of vinyl acetate. Major application of polyvinyl alcohol comprises of textiles, packaging films, adhesives, photosensitive coatings and thickeners. In addition, polyvinyl alcohol is used for manufacturing polyvinyl butyral (PVB), this resin has strong adhesion properties as well as toughness and clarity. PVB is primitively used for producing laminated glass of automobiles and buildings providing transparent and protective layers to glass. The paint and coating industry consume immense volume of vinyl acetate monomers and its consumption proportion is substantially rising due to high demand from various end-user industry like construction, packaging etc. 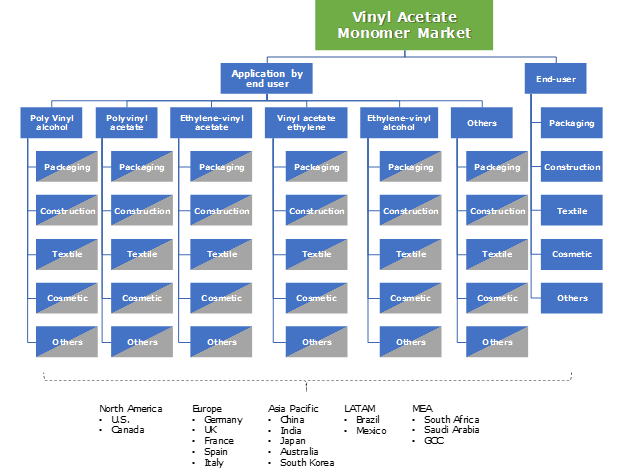 Growing constructions activities in developed and developing countries to establish better infrastructure facilities is accelerating the vinyl acetate monomer market demand. Further government investment in Asia Pacific countries like India and China is fueling paint & coating industry. Automobile industry is growing at phenomenal pace owing to rising consumers demand from Asia Pacific and government initiative to bring in foreign investment in the automobile industry. Changing consumer lifestyle has led to increase in the consumption of packaged food product which had entailed the demand for protective packaging. Packaging materials are exponentially used in food service industry, increasing application of these packaging material in quick service restaurants and fast food outlets is favoring the market. Furthermore, developing economies are perceiving prominent growth in the consumption percentage of personal care and hygiene products which in turn is accelerating the demand for carton packaging. Thus, demand for packaging application in various end-user industries is instrumental in driving the global vinyl acetate monomer market over the forecast period. Global vinyl acetate monomer market is restrained by adverse health impact on inhalation of vinyl acetate monomers causing eye irritation and respiratory tract irritation. Volatility in raw material prices such as ethylene acid may hamper the market over the forecast spell. In addition, stringent government regulation implemented on vinyl acetate such OSHA, EPA and FDA for controlling air, environment pollution and preventing the contact of food from harmful contamination respectively will negatively impact the market growth. Polyvinyl Alcohol market leads the global vinyl acetate monomer market with a CAGR of 5.0%. The segment is driven by usage of polyvinyl alcohol in production of PVB resin which have wide application in laminated glass cast-off for automotive and commercial building. Furthermore, its consumption in textiles industry will drive the growth on the market in forecast period. Polyvinyl Acetate application is the one significant consumer of vinyl acetate monomer market which is expected to surpass USD 2.5 billion in coming years. The application demand is projected to grow over the forecast period due to rising application in adhesives and coatings. Increasing construction activities throughout the world is surging the demand for PVA by 2024. Global vinyl acetate monomer market is segmented into packaging, construction, Cosmetic and textile and others end user industries. Construction application segment is growing significantly at a CAGR of 4.9% while packaging application owns potential market share of global vinyl acetate monomer market. Steady growth in construction activities is inducing higher returns whereas ongoing trend of consuming ready to eat meals and fast foods is positively impacting the market over projected timeframe. Consumption of vinyl acetate in textile industry is held the third-largest market share, in terms of both volume, and revenue throughout the projected timeframe. Vinyl acetate monomer demand is anticipated to grow over the years with increasing focus on fashionable & trendy clothing and home furnishing material. Asia Pacific vinyl acetate monomer market is growing at remarkable pace owing to increasing application in several industry verticals. The market is growing significantly at a CAGR of 5.2% and will dominate the market with potential market share. Government initiative and investment plan toward industrialization in China and India is driving the market. Further government compliance to bring in foreign direct investment for automobile and construction sector will apparently generate higher opportunities for the market. Several companies are expanding their production facilities to Asia Pacific market. For instance, Wacker Chemie had expanded their vinyl acetate production facilities in china and opened new factories in South Korea to meet the growing demand across the globe. Few of the leading vinyl acetate monomer market players are The Dow Chemical Company, Wacker Chemie, Celanese Corporation, KURARAY CO., LTD., Sipchem, NINGXIA YINGLITE CHEMICAL CO., LTD, Ineospec Inc, Exxon Mobil Corporation, Sinopec Group, Arkema and LyondellBasell among others. Companies of this market are following several strategies to strengthen their market position. For instance, few renowned companies like Celanese Corporation which had opened new production plant in Singapore and expanded their production capacity to South Korea to cater to growing demand of vinyl acetate across the globe in various industries. Vinyl acetate monomer is obtained from raw material such as ethylene and acetic acid. Increase in price of ethylene is consequently rising the cost of vinyl acetate monomer due to which several companies like The Dow Chemical Company, Wacker Chemie, Celanese Corporation, etc. had hiked their product prices. Ongoing demand from the emerging countries of the Asia Pacific and advanced economies of the Middle East are compelling the producer to expand their production capacity and exports to North America and Europe. 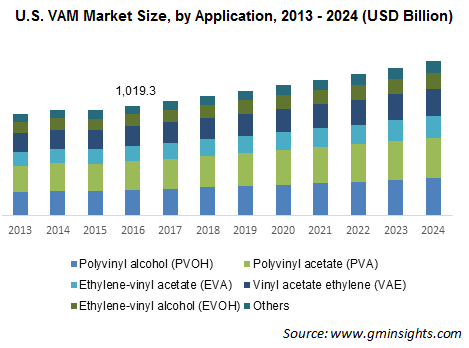 Growing consumption of polyvinyl acetate and polyvinyl alcohol in several end-user industries is positively influencing the vinyl acetate market. Moreover, construction activities in the Middle East region will further drive the vinyl acetate monomer market till the end of the forecast period. The government regulations implemented to protect environment and human health might act as a significant restrain for global vinyl acetate monomer market.